The role of conservators in exhibitions is essential but often unseen. The conservators evaluate the condition of each object and undertake any repairs or treatment needed to render the object safe to display. They also help determine the best way to exhibit a work based on its fragility and advise on the crafting of specialized, custom mounts that offer full support and protection from damage. The Thaw Conservation Center, completed in 2001, is the Morgan's state of the art facility for the treatment of its collections. Before a selection of treasures from the collection go on view in cases in the refurbished interior, all of them must first pass through the conservation center. 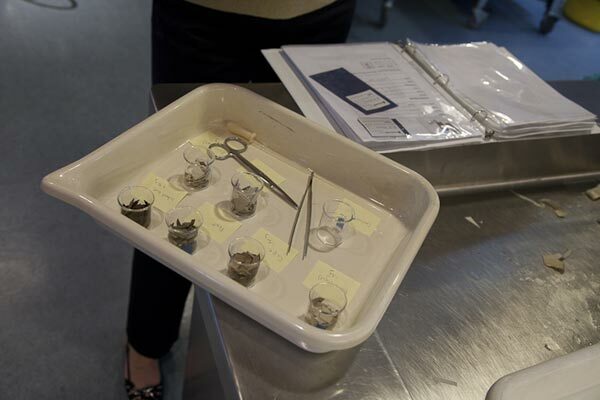 Each object will be examined and the report chronicling its condition will be updated. Different objects present a variety of challenges: tightly bound manuscripts, rippling pages of vellum, thin writing papers. Such physical conditions are among the factors that conservators and curators consider as they evaluate how to best display an object so visitors can fully appreciate it. Conservators test all the various materials—cloth, paper, adhesives, sealants—used in case construction to determine whether or not they produce substances that could prove harmful to the works on display. Fabrics being considered for closed display cases, for example, must be tested for "off-gassing." In order to assess their chemical stability, samples of the fabrics are placed in air-tight containers also holding strips or "coupons" of pure silver, lead, and copper in a controlled environment at sixty degrees centigrade for twenty-eight days. After this period, the silver, lead, and copper coupons are scrutinized for traces of corrosion, proof that acidic gasses have developed during testing. An unsafe environment within a closed display case can prove detrimental to works of art; it may result in a metal object tarnishing or a cellulosic substance, such as paper, becoming darkened and brittle. The Morgan's collection contains a group of letters that Thomas Jefferson wrote to his daughter, Martha (nicknamed Patsy). The 187 affectionate letters span three and one half decades. From France in 1874, Jefferson wrote as an absent father concerned about his daughter's education. As Patsy grew into adulthood, Jefferson shared observations about current events and offered advice on raising children. 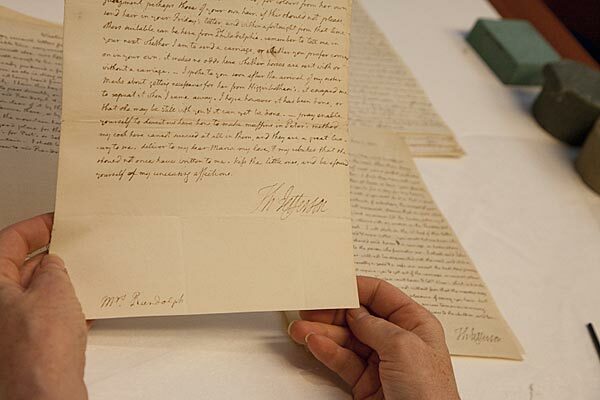 A single Jefferson letter will be on view in the first rotation of J. Pierpont Morgan’s Library. The Morgan's paper conservators are taking this opportunity to examine the condition of all the letters and assess their suitability for treatment. First, the conservator tests the letter's ink to determine whether it is water-soluble. If it is, the pages cannot be washed. If the ink proves to be stable in water, the conservator will gently bathe the letter in buffered, de-ionized water. Washing will remove discoloration and the acidic by-products of deterioration that have accumulated in the paper over time. Depending on its chemical composition, the ink can also have caused the paper to deteriorate. Washing helps to restore hydrogen bonding in the paper, making the sheet stronger and more flexible. Another welcome result of washing can be an improvement in the legibility of the text. It has been estimated that approximately seventy-five percent of the letters can be washed safely. After washing and drying, small repairs will be made to reinforce tears and losses on these papers. Before, during, and after treating the letters, the conservator will document the treatment so that other conservators can trace the history of the object's conservation. When a bound work is to be put on exhibition, a mount or "cradle" must be designed that will prevent undue stress on deteriorated or fragile areas. If a work is considered too fragile to be safely mounted, it may undergo conservation treatment. The extent and complexity of repair varies widely from item to item, but comprehensive treatment of a printed book or bound manuscript may take hundreds of hours. In general, conservators focus their attentions on avoiding structural damage to books on display, but they also work to improve the appearance of items whose damaged condition may interfere with the viewer's experience or understanding of the item. 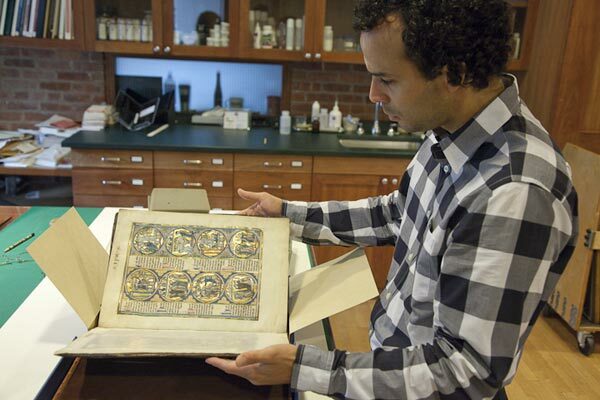 Conservators can face many challenges when considering the mounting of a book. While a wide opening makes it easier for visitors to view books on display, opening a book too far can damage the binding structure, the pages, or both. Illuminated manuscripts can be particularly difficult to mount safely, since excessive flexing of the parchment pages can easily cause the paint and gilding, which are less flexible than the parchment, to crack or even to detach from the page. Bindings with flexible spines, like most original medieval bindings, allow books to open with minimal strain on each page. Unfortunately, many medieval books have been re-bound in more recent centuries, using methods resulting in stiffer spines more compatible with books printed on paper. Surviving medieval bindings, as well as those dating from the later hand-press period, have become fragile with age and should no longer be opened wide for either viewing or reading. 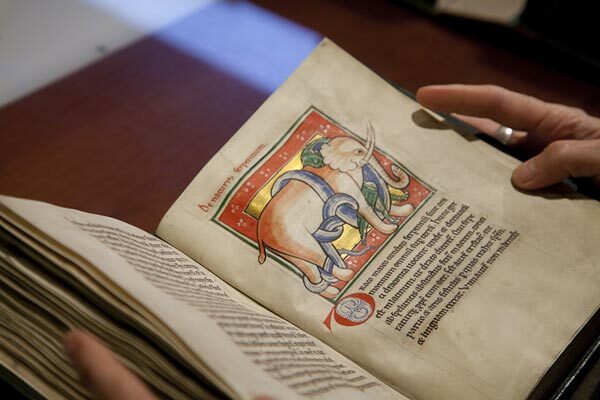 Exhibition mounts must be designed to preserve rare books and manuscripts by giving them proper support while also providing the best possible viewing experience for the visitor. Achieving the proper balance can require both patience and ingenuity. 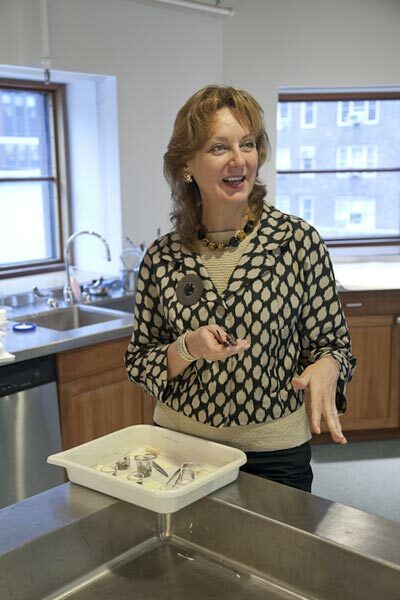 Margaret Holben Ellis, Director, Thaw Conservation Center, explains that off-gassing in a display case could result in a metal object tarnishing or an organic work, like paper, becoming darkened and brittle. Fabric being considered for the cases of the upcoming Anne Morgan exhibition are tested for off-gassing. 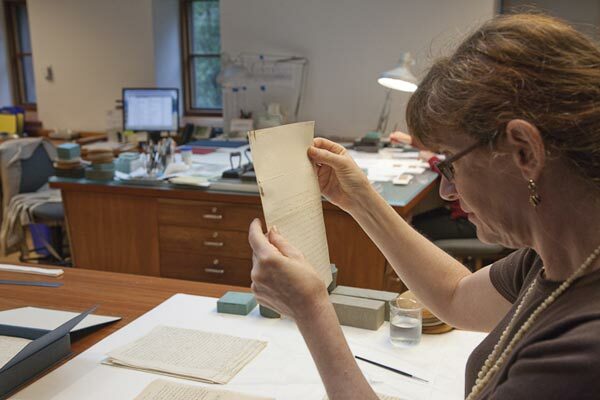 Reba Snyder, Conservator, tests the ink of the Jefferson letters to determine whether or not a page can be treated. 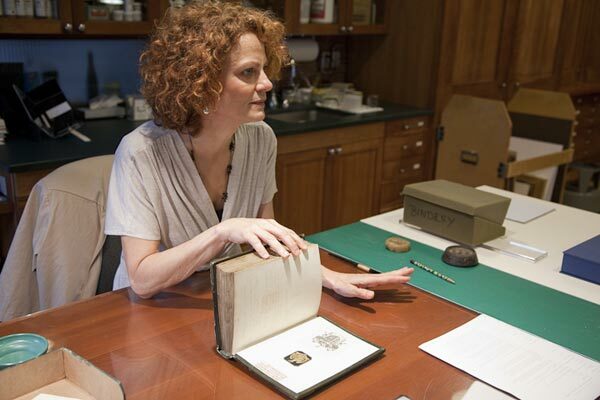 Reba examines stains on one of the letters, which may be removable by bathing the page in de-ionized and pure water. A close up of Thomas Jefferson's signature. Reba remarks that the letters are quite legible and interesting to look at and read. Maria Fredericks, Drue Heinz Book Conservator, explains that for a bound work to be placed on exhibition, a mount must be created that will provide enough support for weak and fragile areas. 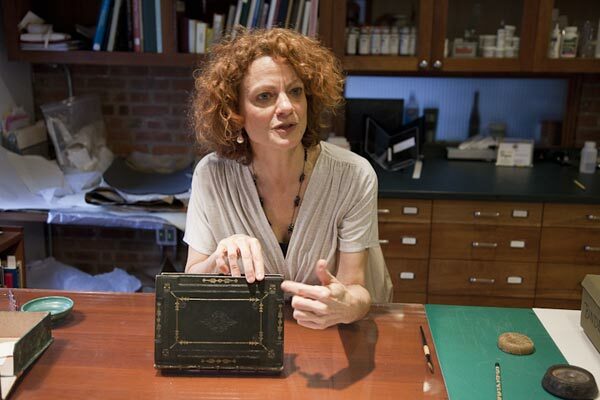 Maria holds a book that will be on display in J. Pierpont Morgan’s Library after its restoration is completed. This particular work creates structural challenges because the pages of the book date to the twelfth century while the binding dates to the nineteenth century. A look at the nineteenth-century binding. 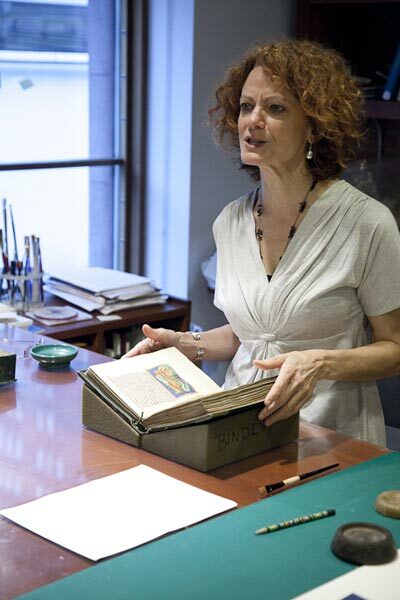 Maria opens the book to reveal the bookplates (one of which is J. P. Morgan's) that indicate three generations of provenance. There is also a handwritten note that indicates a repair job, before the existence of the Thaw Conservation Center. 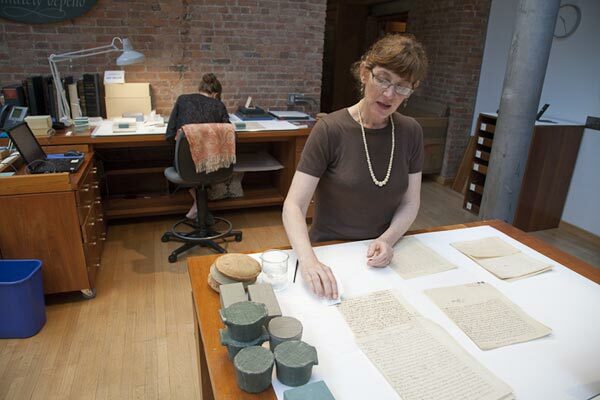 Today, conservators keep records of treatments in a database. 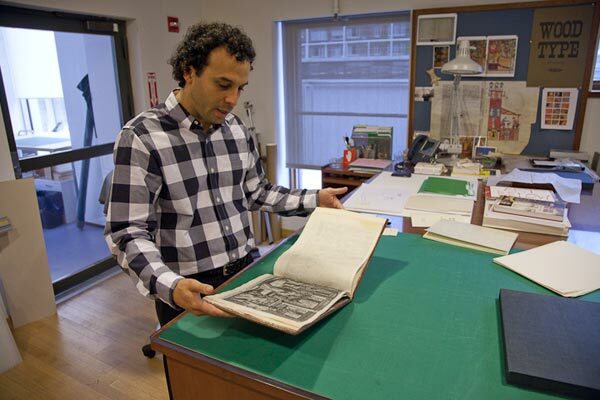 Frank Trujillo, Associate Book Conservator, presents a book that will be on display alongside music manuscripts in the East Room of J. Pierpont Morgan’s Library. He notes that this work is in good condition and will be exhibited on a mount at a high angle so visitors can get a close look at the work. Frank explains that some books in the Morgan have been repaired by rebacking. 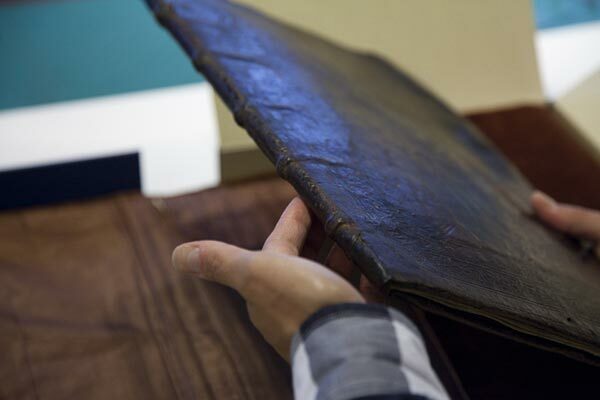 The old leather covering the spine area is removed and replaced by stronger new material. This technique can be used to reattach detached covers, or as part of more extensive repairs to the sewing structure. Frank takes a look at a beautiful, older binding and remarks on the difference in quality and technique of leather binding from the previous book he was examining. The interior of the book is filled with painted and gilded pages. In the front of the book, Belle da Costa Greene, Pierpont Morgan's curator and librarian and eventually the Morgan's first director, made notes on the provenance of the book.